Above: Mila Moursi Paris body care. I recently became acquainted with an exquisite brand of skincare, created by sought-after expert, Mila Moursi. This eponymous line, made entirely in France, focuses on the ritual of key products for a streamlined approach to nourishing one's skin needs on a daily basis. Although the Mila Moursi Paris line (exclusively available at Barney's New York) covers the skincare expanse--from head to toe--this post is specifically devoted to three formulas that currently comprise my own body care ritual. 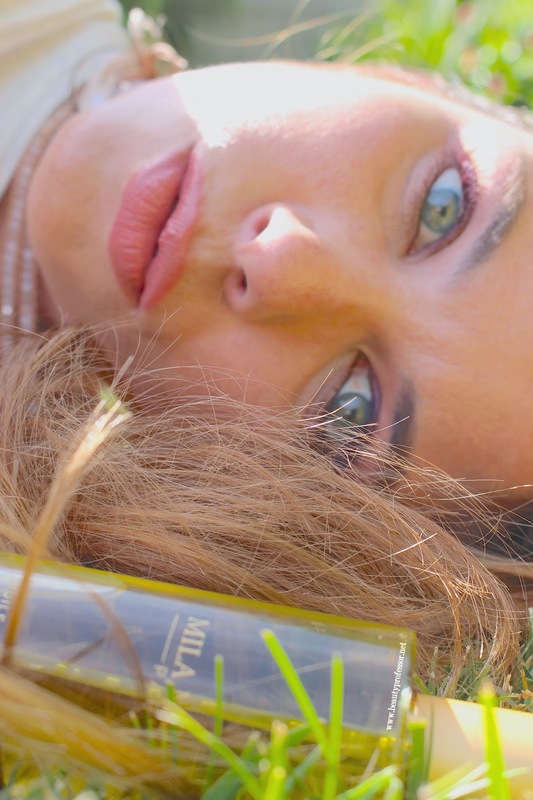 Above: With the sublime Mila Moursi Revitalizing and Beautifying Body Oil. Above: My current Mila Moursi ritual...Shower Gel, Revitalizing and Beautifying Oil and Firming Body Lotion. The lush Shower Gel effectively cleans my skin without stripping it of moisture. Combined with an exfoliating glove or loofah, this gel leaves my skin feeling baby soft and ready for the additional skin care that follows. Plus, I get the closest shave ever! Ingredients: Water, Sodium Lauryl Sulfoacetate, Disodium Laureth Sulfoacetate, Disodium Laureth Sulfosuccinate, Cocomidopropyl Hydroxysultaine, Sodium Cocoyl Apple Amino Acids, Glycerin, PEG-150 Disterate, Laureth-2, PEG-7 Glyceryl Cocoate, PPG-26 Buteth-26, PEG-40 Hydrogenated Castor Oil, Fragrance/Parfum, Althae Officinalis Leaf Extract, Vanda Coerulea Extract, Dimethicone, Hydrogenated Lecithin, Sodium Hyaluronate, Phenoxyethanol, Caprylyl Glycol, Chlorphenesin, Sodium Chloride, Sodium Hydroxide. The Revitalizing and Beautifying Oil is an opulent, antioxidant-rich addition to the trifecta. Silky smooth and instantly absorbed, a few drops on my shower fresh, slightly damp skin sends hydrating deep into the layers of the skin for a nourished canvas with a healthy glow. Ingredients: Prunus Amygdalus Dulcis (Sweet Almond) Oil, Caprylic Triglyceride, Cetearyl Isononanoate, Coconut Alkanes, Coco-Caprylate/Caprate, Cucurbita Pepo (Pumpkin) Seed Extract, Bilberry Oil Seed Extract, Tamarindus Indica Seed, Polysaccharide, Caryodendron Orinosense (Kahai) Seed Oil, Camellia Sinensis Seed Oil, Fragrance/Parfum. The Firming Body Lotion is beyond brilliant. A quarter-sized amount is all that is necessary to moisturize my perenially dry arms and legs and the firming effects are immediately observable. My skin feels revitalized and refreshed with a new sense of elasticity and balance that lasts an entire 24 hours. This amino acid-infused formula may have ruined me for all other body lotions for life...it is that sublime. Ingredients: Water, Coconut Alkanes, Coco-Caprylate/caprate, Stearic Acid, Fragrance/Parfum, Glycerin, Glyceryl Sterate, Dimethicone, Cetyl Alchol, Cyclopentasiloxane, Carthamus Tinctorious (Safflower) Oleocosmes, Sodium Hydroxide, Fucus Vesiculosus Extract, Vitis Vinifera (Grape) Leaf Extract, Aesculus Hippocastanum (Horse Chesnut) Extract, Canola Oil, Silica, Carbomer, Zea Mays (Corn) Starch, Tetrasodium EDTA, Sorbic Acid, Phenoxyethanol, Butylene Glycol, Caprylyl Glycol, Chlorphenesin. Above: All three products in their true form, resplendent in the sunshine. Above: Loving the Mila Moursi line. Bottom Line: My first Mila Moursi Paris skin care ritual is unparalleled. My senses are consistently captured by the soothingly natural aroma and my limbs have never looked better. I appreciate the way in which all three products work in concert to improve the skin on a daily basis, and, in light of this laudable experience, simply cannot wait to try Mila Moursi Paris skin care that is targeted for the facial area next! Have YOU tried Mila Moursi Paris skin care? Thoughts? Good things ahead including fresh foundation, new product procurements and a host of other beauty musings. I'm also in the midst of responding to your lovely comments and emails...by the way, did you notice the latest, more-simplified Beauty Professor header? If so, what do you think? Love the new Header. I think it reflects your style beautifully. It's Classic, clean, and inviting! Working! Thank you so much, Patricia...I appreciate the feedback!